Lawrence and his group of indefatigable and spirited singers, De Covenant have put out a new song and video titled ''You Alone Deserve The Glory'' to celebrate 9 years of grace, divine speed and from glory to glory. "God truly deserves all the glory because we are not achievers, but simply receivers! Today, September 25th marks 9 years together as a group. We are more than thankful Lord." - Lawrence Enweriku [Visioneer & leader]. By the grace of God, they have a special mandate from God for the less privileged and widows, to assist in whatever capacity they are privileged to. The band officially started in September 25th 2009, in a prayer camp meeting where they engaged God in a three day fasting and prayer. It was on the third day that God by Himself gave them the name "De Covenant". Lawrence Enweriku [Lawrence DeCovenant] is the privileged leader and visioneer of DeCovenant Musical Entertainment also known as DeCovenant. The group consist of 17 members 8 musicians and 9 vocalists. They have worked with a lot of gospel artists, and have shared stage with the likes of Micah Stampley, Gabriel Eziashi, Sammie Okposo, Frank Edwards, Tosin Martins, Freke Umoh, Midnight Crew, Eben, to mention a few. 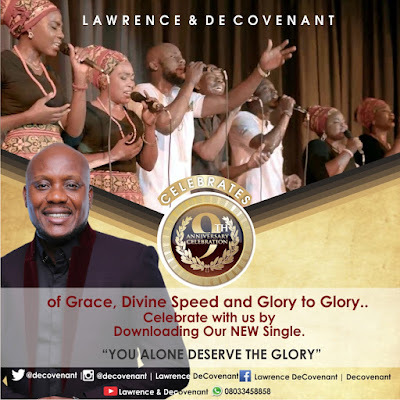 Lawrence & DeCovenant released their debut album in 2009 titled "Call Am Oga "and in 2014 they came out with another album titled "Grace " which includes songs like the popular "You Are The Reason'', ''Call Am Oga Remix'', ''Oghene Doh'', ''African Praise Medley'' & ''Something''. Lawrence & DeCovenant introduced the first of its kind in Nigeria, a live recording concert from which two different albums were released "Grace Live'' DVDs & ''Grace Live'' Audio. These great albums have been a blessing to so many all over the world with great testimonies. The live recording held on the 28th of October 2014 and with a click on Google or YouTube all these videos and audios are available for free download and previews. They had another live recording concert in February 28th 2016 featuring some of Nigeria’s finest gospel artists such as Tosin Martins, Mike Abdul, Efe Nathan, Mairo Ese, & Ibitayo Jeje. In more recent times, Lawrence DeCovenant has ministered in several churches in Nigeria and across the globe such as Living Faith Churches, House On The Rock churches, Word Of Life Bible Church, Warri, Holy Ghost Christian Center churches in the USA and UK, RCCG Dominion Cathedral New Jersey USA, RCCG Jesus House Baltimore, Maryland USA, RCCG Liberty House London UK and host of other RCCG churches. A proud member of Winners Chapel, Lawrence DeCovenant is married and blessed with three boys. Presently, Lawrence & DeCovenant is getting ready to unveil their brand new live recorded album soon.